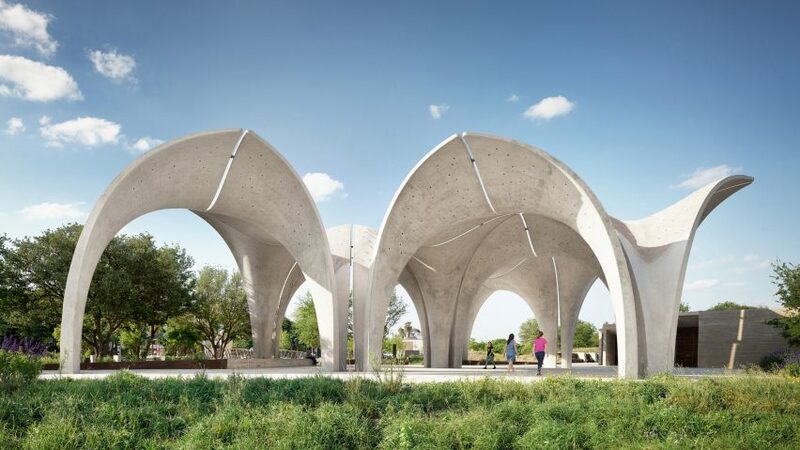 American firms Lake Flato and Matsys, along with landscape architect Rialto Studio, have designed a riverfront park in southern Texas, with sculptural pavilions that provide shade on sunny days and help collect rainwater during storms. 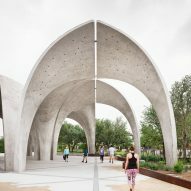 Confluence Park is located on a bluff overlooking the point where the San Pedro Creek merges with the San Antonio River. 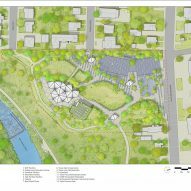 Covering three acres (1.2 hectares), the public park encompasses a classroom building, a main pavilion and three smaller pavilions. The park is overseen by the San Antonio River Foundation, which manages the watershed. 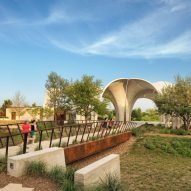 "Confluence Park is a living laboratory that allows visitors to gain a greater understanding of the ecotypes of the South Texas region and the function of the San Antonio River watershed," said local architecture firm Lake Flato in a project description. "Throughout the park, visitors learn through observation, engagement and active participation." Lake Flato said the "idea of confluence" and flowing water heavily informed the park's design, from the patterning in the pavers to the sculpting of the landscape. The firm collaborated with two design firms on the project: Matsys, an interdisciplinary studio in San Francisco; and Rialto Studio, a local landscape architecture practice. 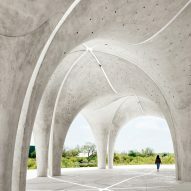 The centrepiece of the park is the main pavilion, which consists of 22 concrete "petals" that form giant archways. 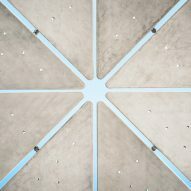 The sculptural panels were cast on-site and lifted into place, similar to tilt-wall construction. At night, the dramatic structure is illuminated by up-lights that are discreetly embedded in the pavers. The thickness of the curved walls decreases as they ascend to a pinnacle of 26 feet (eight metres). The concrete petals were also used to construct the smaller pavilions, which rise 17 feet (five metres). 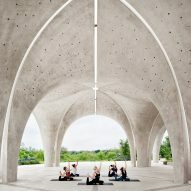 The pavilion forms go beyond aesthetics. The petals are designed to funnel rainwater to a catchment system – the park's primary source of water. In addition to collecting water, the structures offer refuge from the summer heat. 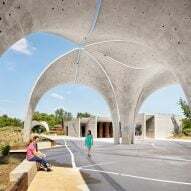 "The pavilions throughout the park provide shade and shelter, simultaneously engaging visitors to visualise the cycle of water at Confluence Park and how it relates directly to the rivershed," the team said. Adjacent to the main pavilion is the classroom building, called the Estella Avery Education Center. 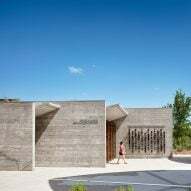 Partly embedded in a berm, the rectilinear facility features board-formed concrete walls, large pivot doors with wooden slats, and a roof covered in native grasses. The architects also installed a rooftop solar array that provides "100 per cent of onsite energy on a yearly basis". 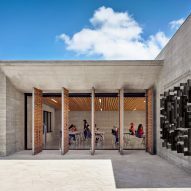 Founded in 1984, Lake Flato has created a number of distinctive projects in North and Central America, including a boutique hotel in Mexico with whitewashed walls and framed ocean views, and a vacation home in Texas Hill Country that rises up from a hillside and overlooks a lake.